A newly published report titled "Between Crimea and the Crisis" puts forward two scenarios of Russia's future, both of which predict serious domestic upheavals. Everything hinges on the outcome of the Ukrainian conflict. How likely are these scenarios? RBTH investigates. Russia will be swept by moods of protest. When? It all depends on the situation in south-eastern Ukraine. These are the views expressed in "Between Crimea and the Crisis," a report prepared for the Committee of Civil Initiatives, which is managed by ex-Finance Minister Alexei Kudrin, and published on March 31 on the committee's site. According to the report, domestic events in Russia are likely to evolve according to two scenarios. The first envisages an end to the military conflict in Ukraine and a concurrent relaxation of the international pressure on Russia, which, with the lack of an external threat, will redirect citizens’ attention to the problems of the economy. The aggression currently focused on perceived external enemies will be channeled towards internal ones: "officials and migrants." Support for the government will drastically fall, which could lead to serious economic protests similar in size to the ones in 2011-2012. The second scenario looks at the possible consequences of a protracted armed conflict and posits that "the mass consciousness will support the country's self-isolation." In such a situation, says the report, the aggression towards the perceived external enemy will remain, but weariness of the conflict and the crisis will lead to protests and "the gradual erosion of support for the government." The authors of the report expect serious political consequences to manifest themselves during the 2016 parliamentary elections. The report’s principal author is economist Mikhail Dmitriev, ex-Deputy Minister of Economic Development and Trade. 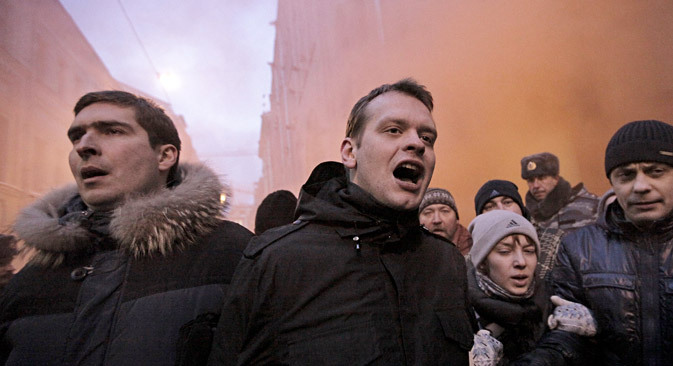 Dmitriev earlier predicted the development of the crisis in 2008 and the protests of 2011. Other experts have various opinions of the report prepared by Kudrin's team. "It says that a détente would create problems for the government, moreover, starting with the 2016 elections,” says Konstantin Kalachev, director of the independent Political Expert Group. “I think it is the contrary: A détente would stabilize the government's position, while a protracted conflict and self-isolation would not help confidence ratings to remain high for long." Kalachev reminds us that George Bush, Jr.'s rating swelled during America's invasion of Iraq, "but when the U.S. was bogged down in Iraq, the rating declined." If Russia "gets bogged down in Ukraine," it is inevitable that the same thing will happen. Professor Leonid Polyakov of the Department of Political Sciences at the Higher School of Economics agrees that the settlement of the Ukrainian conflict will have beneficial effects on Russia. Polyakov believes that if the war of sanctions continues, it will indeed lead to "an isolated existence," but this will not result in acts of protests against the government or migrant workers. "I don't see a link between the growth of xenophobic attitudes and the West's pressure on us," says Polyakov. "The migrants in Russia by no means come from the West." However, everyone RBTH interviewed spoke about the instability of Russian President Vladimir Putin’s confidence rating, as well as that of ruling party United Russia. Kalachev is convinced that Putin’s rating is high thanks to the support of two groups: those who expect stability from the government and those who seek mobilization and new feats. "But the interests of the first category contradict the interests of the second," says Kalachev. "And when they collide, the rating may even be annihilated." The rating is indeed anomalously high (75 percent in March 2015, according to the Public Opinion Foundation). This is the direct consequence of Russia's annexation of Crimea, explains Polyakov. Therefore, the indicator should fall to a normally high level of two thirds (60-65 percent). "That is the precise percentage of those who stably vote for the president," he said. According to Natalya Zubarevich, director of regional programs at the Independent Institute of Social Politics, "a decrease is inevitable." Zubarevich recalls that the rating fell after the Georgian War in 2008, influenced by the economic crisis, sinking to a low in 2013 (Vladimir Putin's maximum disapproval rating was in February 2013: at the time, 35 percent of Russians disapproved of the president, according to a Levada Center survey). "I think that now the rating will fall at the same speed," says Zubarevich. She adds that back then, however, there was no "total propaganda" of the kind seen today. But it is nevertheless clear, she says, hinting at many Russians’ frustration with a lack of EU food imports due to Moscow’s embargo, how what she describes as "the great war between the refrigerator and the television" will end.